VANCOUVER, BRITISH COLUMBIA–(Marketwire – July 5, 2012) – Stornoway Diamond Corporation (TSX:SWY) is pleased to announce that it has executed a Declaration of Partnership (the "Declaration") with the communities of Chibougamau and Chapais in the James Bay Region of Québec. The Declaration is a statement of cooperation between the partners for the responsible development of Stornoway's 100% owned Renard Diamond Project based on the principles of environmental protection, social responsibility and economic efficiency. The Declaration was signed in Chibougamau on July 5th by Mme. Manon Cyr, Mayor of Chibougamau, M. Steve Gamache, Mayor of Chapais, and M. Patrick Godin, Chief Operating Officer of Stornoway. The Declaration provides for the creation of a Renard Liaison Committee that will address issues of mutual interest such as communication, employment, and the economic diversification of local communities. In particular, the committee will oversee initiatives to attract and retain new residents to the towns of Chibougamau and Chapais. Matt Manson, Stornoway's President and CEO, stated: "The Declaration of Partnership with Chibougamau and Chapais is a further example of the framework of trust, transparency and cooperation with which we seek to develop Québec's first diamond mine. It follows the execution of the Mecheshoo Agreement with the Crees of the James Bay Region in March, which was established on similar principles. For Stornoway, the Declaration is an expression of the importance we place on Chibougamau and Chapais as commercial centers, and future civic partners, for the successful development of Renard." Manon Cyr, Mayor of Chibougamau stated: "This accord confirms the common bond of cooperation and respect between our two cities and Stornoway in the development of the Renard Project, which has been in existence for several years now. Today's signing marks the beginning of a new phase, allowing us to plan for the future by strengthening the collaboration between the City of Chibougamau and Stornoway." For his part, Steve Gamache, Mayor of Chapais stated: "The Declaration of Partnership is part of a new era of economic and social development based on respect, mutual trust and a shared understanding of the issues of each partner. The town of Chapais is extremely proud to work with Stornoway Diamond Corporation on the development of this leading diamond mining project." Stornoway is a leading Canadian diamond exploration and development company listed on the Toronto Stock Exchange under the symbol SWY. 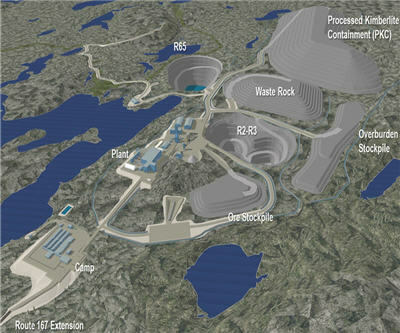 Our flagship asset is the 100% owned Renard Diamond Project, on track to becoming Québec's first diamond mine. Stornoway also maintains an active diamond exploration program with both advanced and grassroots programs in the most prospective regions of Canada. Stornoway is a growth oriented company with a world class asset, in one of the world's best mining jurisdictions, in one of the world's great mining businesses. Forward-looking statements are made based upon certain assumptions by Stornoway or its consultants and other important factors that, if untrue, could cause the actual results, performances or achievements of Stornoway to be materially different from future results, performances or achievements expressed or implied by such statements. Such statements and information are based on numerous assumptions regarding present and future business strategies and the environment in which Stornoway will operate in the future, including the price of diamonds, anticipated costs and ability to achieve goals. Certain important factors that could cause actual results, performances or achievements to differ materially from those in the forward-looking statements include, but are not limited to: (i) estimated approval date of the Environmental and Social Impact Assessment; (ii) required capital investment and estimated workforce requirements; (iii) estimates of net present value and internal rates of return; (iv) receipt of regulatory approvals on acceptable terms within commonly experienced time frames; (v) the assumption that a production decision will be made, and that decision will be positive; (vi) anticipated timelines for the commencement of mine production; (vii) anticipated timelines related to the Route 167 extension and the impact on the development schedule at Renard; (viii) anticipated timelines for community consultations and the impact of those consultations on the regulatory approval process; (ix) market prices for rough diamonds and the potential impact on the Renard Project's value; and (x) future exploration plans and objectives.